Comfortable care and professional quality work are key elements to successful dentistry. 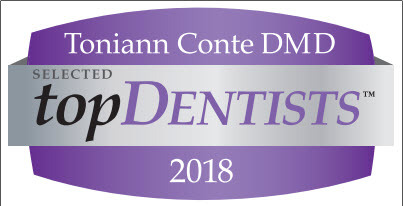 Dr. Toniann Conte understands that quality and care go hand-in-hand, and make sure that this approach is the foundation of all dental care we provide. Conte Dental provides general dental and cosmetic dental services. Every person has a story behind their smile, and we have been privileged to be a part of the stories of new and existing patients for 25 years. Dr. Conte is dedicated to ensuring patients receive dental care personalized to their unique smile goals and oral health needs. At Conte Dental, our patients are treated as if they were our own family members. Our personal and professional staff members maintain a one-on-one approach and are here to answer any of your dental concerns. Dr. Conte is extremely friendly to our patients, ensuring that you feel comfortable voicing any and all questions. We are also in-network providers for most major dental insurance plans. Through our dedication to compassionate care, you can rest easy knowing their smiles are in professional, caring hands. We have even been voted Bonita Springs' Best Dentist by our local newspaper. Conte Dental has been serving the greater Bonita Springs, Naples, and Fort Myers area for 30 years. To learn more about Dr. Conte and our practice, or to schedule an appointment, contact our Bonita Springs dental team today!